HCM CITY (VNS) — While more jobs will be created as the ASEAN Economic Community (AEC) comes into effect by the year-end, the number of Vietnamese workers with skills that meet international labour market remains insufficient. According to the International Labour Organisation (ILO), the number of jobs in Viet Nam will increase 14.5 per cent by 2025. Demand for medium-level professional skills will increase the most rapidly, at 28 per cent, while demand for low-level skills will rise 23 per cent and for high-level skills 13 per cent. In its report, "ASEAN Community 2015: Managing Integration for Better Jobs and Shared Prosperity", ILO said Viet Nam did not have enough professionally skilled workers and that many workers had yet to receive adequate training. The report also said the proportion of labourers who must be retrained was high, and that many of them had poor foreign language skills and soft skills, such as the ability to work in teams. Knowledge about technology and science was also low, as well as understanding about company culture and laws in other countries, the report said. Labour productivity in Viet Nam is the lowest in Asia – Pacific, 15 times lower than Singapore, 11 times lower than Japan, and 10 times lower than South Korea. Viet Nam's labour capacity is one-fifth of Malaysia's and two-fifths of Thailand's, according to the ILO report. "If labour capacity cannot be increased, it will seriously affect the competitive ability and labour value in the AEC, where many people will be able work anywhere in the region," Luu Dinh Vinh, lecturer at the HCM City Economic College, was quoted as saying in Thoi Nay (Today) newspaper. "Low labour capacity will also hinder HCM City's integration into the AEC," he added. Viet Nam has 54 universities, 25 professional colleges, 12 vocational colleges (three-year degree programmes), 26 vocational intermediates (two-year degree programmes) and 370 vocational training centres (short-term certificate programmes). Training needs to be reviewed and changed at many schools. For example, the Hung Vuong Vocational Intermediate School has spent US$1.1 million for instructional facilities for electronics and refrigerator courses, and VND6 billion ($263,000) for an English-language lab to teach skills for the TOEIC test. "It's very hard to recruit students because 12th graders enter university, but 9th graders (who can enter vocational intermediate schools directly after 9th grade) do not have enough ability to learn high-tech jobs," Nguyen Ngoc Hanh, deputy principal of the Hung Vuong Vocational Intermediate School, said. "Co-operation with enterprises is also limited. We've been able to work with small enterprises that have recruited only dozens of students each year," he added. 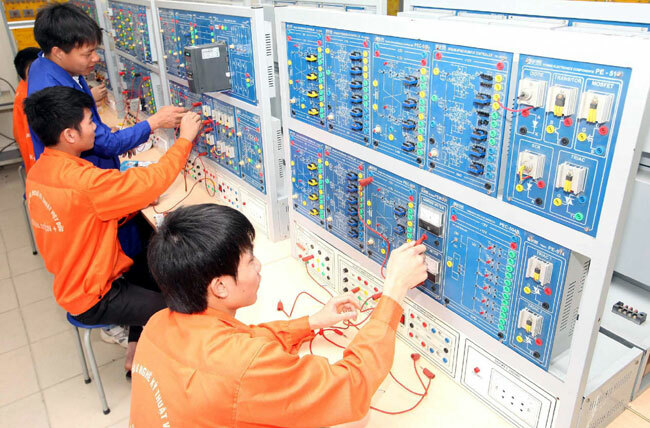 "The relationship between vocational training schools and the business community is very loose, but training must be closely linked with reality when international integration begins," Pham Ngoc Hung, deputy chairman of HCM City Enterprises Association, said. "Right now, enterprises can't recruit enough qualified workers at vocational schools and the schools don't have enough students qualified to work in pilot programmes in enterprises," he added. Hung suggested that the Government create policies to encourage enterprises to work closely with vocational training schools. "This kind of policy would help increase vocational training quality," he said. Dr. Ho Ba Tham, senior expert at the HCM City Society Research Institute, said that Viet Nam had no choice but to make training changes. "It's not only about competitiveness among enterprises, but competition among countries," he said. Changes must be carried out at both the macro and micro level, he said. "The city can review the number of unemployed people and the number of labourers that enterprises require. Then authorities can provide short-term training for these people based on enterprises' requirements," he said. "Soft skills must also be taught in school, especially communication and teamwork skills," he said. Tran Anh Tuan, deputy director of HCM City's Centre for Human Resources and Labour Market Information, said the city must create a master plan for the vocational training system based on the demand of the labour market and international standards. "The city must also invest in labour analysis and forecasting in three areas: training, enterprises and jobs," he said.